The nucleus of Comet Tempel 1. The nucleus is the solid, central part of a comet, popularly termed a dirty snowball or an icy dirtball. A cometary nucleus is composed of rock, dust, and frozen gases. When heated by the Sun, the gases sublimate and produce an atmosphere surrounding the nucleus known as the coma. The force exerted on the coma by the Sun's radiation pressure and solar wind cause an enormous tail to form, which points away from the Sun. A typical comet nucleus has an albedo of 0.04. This is blacker than coal, and may be caused by a covering of dust. Results from the Rosetta and Philae spacecraft show that the nucleus of 67P/Churyumov–Gerasimenko has no magnetic field, which suggests that magnetism may not have played a role in the early formation of planetesimals. Further, the ALICE spectrograph on Rosetta determined that electrons (within 1 km (0.62 mi) above the comet nucleus) produced from photoionization of water molecules by solar radiation, and not photons from the Sun as thought earlier, are responsible for the degradation of water and carbon dioxide molecules released from the comet nucleus into its coma. On 30 July 2015, scientists reported that the Philae spacecraft, that landed on comet 67P/Churyumov-Gerasimenko in November 2014, detected at least 16 organic compounds, of which four (including acetamide, acetone, methyl isocyanate and propionaldehyde) were detected for the first time on a comet. Comets, or their precursors, formed in the outer Solar System, possibly millions of years before planet formation. How and when comets formed is debated, with distinct implications for Solar System formation, dynamics, and geology. Three-dimensional computer simulations indicate the major structural features observed on cometary nuclei can be explained by pairwise low velocity accretion of weak cometesimals. The currently favored creation mechanism is that of the nebular hypothesis, which states that comets are probably a remnant of the original planetesimal "building blocks" from which the planets grew. Astronomers think that comets originate in both the Oort cloud and the scattered disk. Most cometary nuclei are thought to be no more than about 16 kilometers (10 miles) across. The largest comets that have come inside the orbit of Saturn are C/2002 VQ94 (≈100 km), Hale–Bopp (≈60 km), 29P (≈30.8 km), 109P/Swift–Tuttle (≈26 km), and 28P/Neujmin (≈21.4 km). The potato-shaped nucleus of Halley's comet (15 × 8 × 8 km) contains equal amounts of ice and dust. During a flyby in September 2001, the Deep Space 1 spacecraft observed the nucleus of Comet Borrelly and found it to be about half the size (8×4×4 km) of the nucleus of Halley's Comet. Borrelly's nucleus was also potato-shaped and had a dark black surface. Like Halley's Comet, Comet Borrelly only released gas from small areas where holes in the crust exposed the ice to sunlight. The nucleus of comet Hale–Bopp was estimated to be 60 ± 20 km in diameter. Hale-Bopp appeared bright to the unaided eye because its unusually large nucleus gave off a great deal of dust and gas. The nucleus of P/2007 R5 is probably only 100–200 meters in diameter. The largest centaurs (unstable, planet crossing, icy asteroids) are estimated to be 250 km to 300 km in diameter. Three of the largest would include 10199 Chariklo (258 km), 2060 Chiron (230 km), and the currently lost 1995 SN55 (≈300 km). Known comets have been estimated to have an average density of 0.6 g/cm3. Below is a list of comets that have had estimated sizes, densities, and masses. About 80% of the Halley's Comet nucleus is water ice, and frozen carbon monoxide (CO) makes up another 15%. Much of the remainder is frozen carbon dioxide, methane, and ammonia. 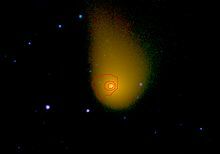 Scientists think that other comets are chemically similar to Halley's Comet. The nucleus of Halley's Comet is also an extremely dark black. Scientists think that the surface of the comet, and perhaps most other comets, is covered with a black crust of dust and rock that covers most of the ice. These comets release gas only when holes in this crust rotate toward the Sun, exposing the interior ice to the warming sunlight. The composition of water vapor from Churyumov–Gerasimenko comet, as determined by the Rosetta mission, is substantially different from that found on Earth. The ratio of deuterium to hydrogen in the water from the comet was determined to be three times that found for terrestrial water. 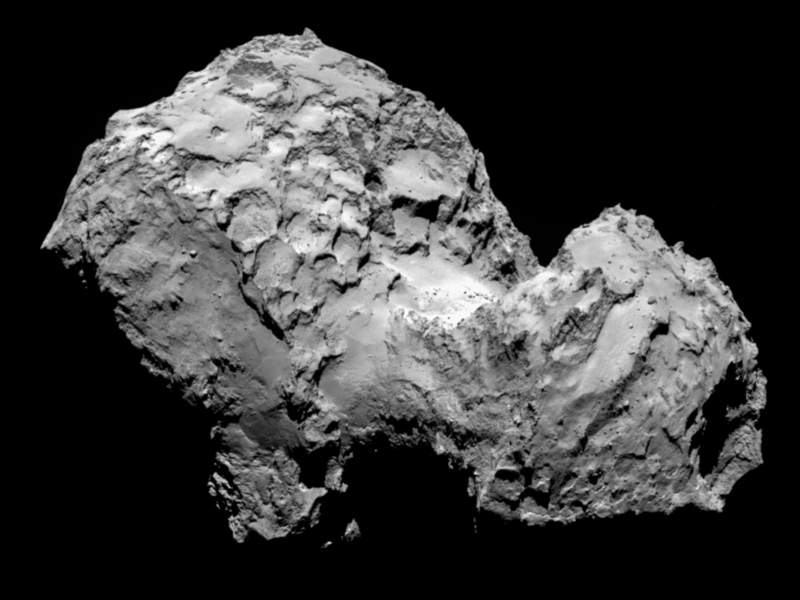 This makes it unlikely that water on Earth came from comets such as Churyumov–Gerasimenko. On 67P/Churyumov–Gerasimenko comet, some of the resulting water vapour may escape from the nucleus, but 80% of it recondenses in layers beneath the surface. This observation implies that the thin ice-rich layers exposed close to the surface may be a consequence of cometary activity and evolution, and that global layering does not necessarily occur early in the comet's formation history. Measurements carried out by the Philae lander on 67P/Churyumov–Gerasimenko comet, indicate that the dust layer could be as much as 20 cm (7.9 in) thick. Beneath that is hard ice, or a mixture of ice and dust. 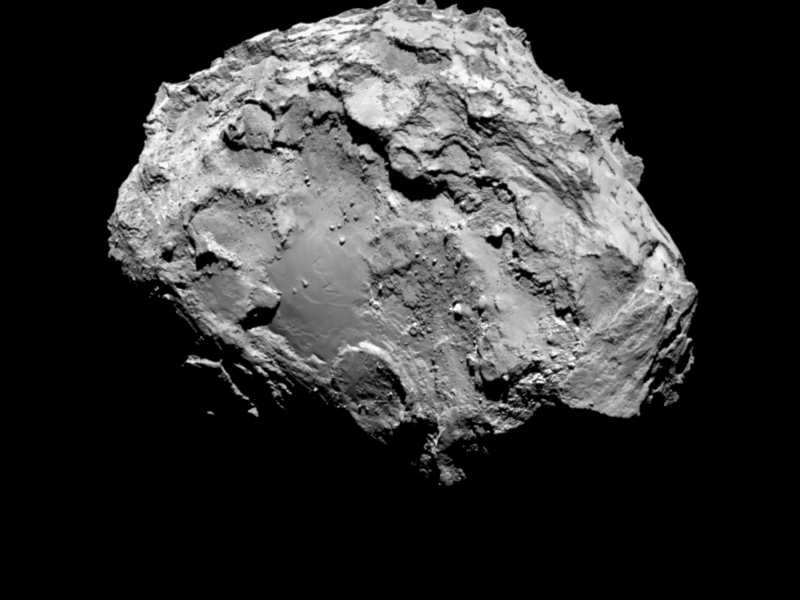 Porosity appears to increase toward the center of the comet. While most scientists thought that all the evidence indicated that the structure of nuclei of comets is processed rubble piles of smaller ice planetesimals of a previous generation, the Rosetta mission dispelled the idea that comets are "rubble piles" of disparate material. The nucleus of some comets may be fragile, a conclusion supported by the observation of comets splitting apart. Splitting comets include 3D/Biela in 1846, Shoemaker–Levy 9 in 1992, and 73P/Schwassmann–Wachmann from 1995 to 2006. Greek historian Ephorus reported that a comet split apart as far back as the winter of 372–373 BC. Comets are suspected of splitting due to thermal stress, internal gas pressure, or impact. Comets 42P/Neujmin and 53P/Van Biesbroeck appear to be fragments of a parent comet. Numerical integrations have shown that both comets had a rather close approach to Jupiter in January 1850, and that, before 1850, the two orbits were nearly identical. Cometary nuclei are among the darkest objects known to exist in the Solar System. The Giotto probe found that Comet Halley's nucleus reflects approximately 4% of the light that falls on it, and Deep Space 1 discovered that Comet Borrelly's surface reflects only 2.5–3.0% of the light that falls on it; by comparison, fresh asphalt reflects 7% of the light that falls on it. It is thought that complex organic compounds are the dark surface material. Solar heating drives off volatile compounds leaving behind heavy long-chain organics that tend to be very dark, like tar or crude oil. The very darkness of cometary surfaces allows them to absorb the heat necessary to drive their outgassing. Roughly six percent of the near-Earth asteroids are thought to be extinct nuclei of comets (see Extinct comets) which no longer experience outgassing. Two near-Earth asteroids with albedos this low include 14827 Hypnos and 3552 Don Quixote. The first relatively close mission to a comet nucleus was space probe Giotto. This was the first time a nucleus was imaged at such proximity, coming as near as 596 km. The data was a revelation, showing for the first time the jets, the low-albedo surface, and organic compounds. During its flyby, Giotto was hit at least 12,000 times by particles, including a 1-gram fragment that caused a temporary loss of communication with Darmstadt. Halley was calculated to be ejecting three tonnes of material per second from seven jets, causing it to wobble over long time periods. Comet Grigg–Skjellerup's nucleus was visited after Halley, with Giotto approaching 100–200 km. Results from the Rosetta and Philae spacecraft show that the nucleus of 67P/Churyumov–Gerasimenko has no magnetic field, which suggests that magnetism may not have played a role in the early formation of planetesimals. Further, the ALICE spectrograph on Rosetta determined that electrons (within 1 km (0.62 mi) above the comet nucleus) produced from photoionization of water molecules by solar radiation, and not photons from the Sun as thought earlier, are responsible for the degradation of water and carbon dioxide molecules released from the comet nucleus into its coma. ^ Robert Roy Britt (29 November 2001). "Comet Borrelly Puzzle: Darkest Object in the Solar System". Space.com. Archived from the original on 22 January 2009. Retrieved 26 October 2008. ^ a b "ESA Science & Technology: Halley". ESA. 10 March 2006. Retrieved 22 February 2009. ^ a b Bauer, Markus (14 April 2015). "Rosetta and Philae Find Comet Not Magnetised". European Space Agency. Retrieved 14 April 2015. ^ a b Schiermeier, Quirin (14 April 2015). "Rosetta's comet has no magnetic field". Nature. doi:10.1038/nature.2015.17327. ^ a b Agle, DC; Brown, Dwayne; Fohn, Joe; Bauer, Markus (2 June 2015). "NASA Instrument on Rosetta Makes Comet Atmosphere Discovery". NASA. Retrieved 2 June 2015. ^ a b Feldman, Paul D.; A'Hearn, Michael F.; Bertaux, Jean-Loup; Feaga, Lori M.; Parker, Joel Wm. ; et al. (2 June 2015). "Measurements of the near-nucleus coma of comet 67P/Churyumov-Gerasimenko with the Alice far-ultraviolet spectrograph on Rosetta" (PDF). Astronomy and Astrophysics. 583: A8. arXiv:1506.01203. Bibcode:2015A&A...583A...8F. doi:10.1051/0004-6361/201525925. ^ Jordans, Frank (30 July 2015). "Philae probe finds evidence that comets can be cosmic labs". The Washington Post. Associated Press. Retrieved 30 July 2015. ^ "Science on the Surface of a Comet". European Space Agency. 30 July 2015. Retrieved 30 July 2015. ^ Bibring, J.-P.; Taylor, M.G.G.T. ; Alexander, C.; Auster, U.; Biele, J.; Finzi, A. Ercoli; Goesmann, F.; Klingehoefer, G.; Kofman, W.; Mottola, S.; Seidenstiker, K.J. ; Spohn, T.; Wright, I. (31 July 2015). "Philae's First Days on the Comet - Introduction to Special Issue". Science. 349 (6247): 493. Bibcode:2015Sci...349..493B. doi:10.1126/science.aac5116. PMID 26228139. Retrieved 30 July 2015. ^ "How comets were assembled". University of Bern via Phys.org. 29 May 2015. Retrieved 8 January 2016. ^ Jutzi, M.; Asphaug, E. (June 2015). "The shape and structure of cometary nuclei as a result of low-velocity accretion". Science. 348 (6241): 1355–1358. Bibcode:2015Sci...348.1355J. doi:10.1126/science.aaa4747. PMID 26022415. ^ Weidenschilling, S. J. (June 1997). "The Origin of Comets in the Solar Nebula: A Unified Model". Icarus. 127 (2): 290–306. Bibcode:1997Icar..127..290W. doi:10.1006/icar.1997.5712. ^ Choi, Charles Q. (15 November 2014). "Comets: Facts About The 'Dirty Snowballs' of Space". Space.com. Retrieved 8 January 2016. ^ Nuth, Joseph A.; Hill, Hugh G. M.; Kletetschka, Gunther (20 July 2000). "Determining the ages of comets from the fraction of crystalline dust". Nature. 406 (6793): 275–276. Bibcode:2000Natur.406..275N. doi:10.1038/35018516. PMID 10917522. ^ "How Asteroids and Comets Formed". Science Clarified. Retrieved 16 January 2016. ^ Levison, Harold F.; Donnes, Luke (2007). "Comet Populations and Cometary Dynamics". In McFadden, Lucy-Ann Adams; Weissman, Paul Robert; Johnson, Torrence V. (eds.). Encyclopedia of the Solar System (2nd ed.). Amsterdam: Academic Press. pp. 575–588. ISBN 0-12-088589-1. ^ a b c d e f g Yeomans, Donald K. (2005). "Comets (World Book Online Reference Center 125580)". NASA. Archived from the original on 29 April 2005. Retrieved 20 November 2007. ^ a b "What Have We Learned About Halley's Comet?". Astronomical Society of the Pacific (No. 6 – Fall 1986). 1986. Retrieved 14 December 2008. ^ a b Weaver, H. A.; Stern, S.A.; Parker, J. Wm. (2003). "Hubble Space Telescope STIS Observations of Comet 19P/BORRELLY during the Deep Space 1 Encounter". The American Astronomical Society. 126 (1): 444–451. Bibcode:2003AJ....126..444W. doi:10.1086/375752. Retrieved 14 December 2008. ^ Fernández, Yanga R. (2002). "The Nucleus of Comet Hale-Bopp (C/1995 O1): Size and Activity". Earth, Moon, and Planets. 89 (1): 3–25. Bibcode:2002EM&P...89....3F. doi:10.1023/A:1021545031431. ^ "SOHO's new catch: its first officially periodic comet". European Space Agency. 25 September 2007. Retrieved 20 November 2007. ^ a b c d D. T. Britt; G. J. Consol-magno SJ; W. J. Merline (2006). "Small Body Density and Porosity: New Data, New Insights" (PDF). Lunar and Planetary Science XXXVII. Retrieved 14 December 2008. ^ Halley: Using the volume of an ellipsoid of 15x8x8km * a rubble pile density of 0.6 g/cm3 yields a mass (m=d*v) of 3.02E+14 kg. Tempel 1: Using a spherical diameter of 6.25 km; volume of a sphere * a density of 0.62 g/cm3 yields a mass of 7.9E+13 kg. 19P/Borrelly: Using the volume of an ellipsoid of 8x4x4km * a density of 0.3 g/cm3 yields a mass of 2.0E+13 kg. 81P/Wild: Using the volume of an ellipsoid of 5.5x4.0x3.3km * a density of 0.6 g/cm3 yields a mass of 2.28E+13 kg. ^ RZ Sagdeev; PE Elyasberg; VI Moroz. (1988). "Is the nucleus of Comet Halley a low density body?". Nature. 331 (6153): 240–242. Bibcode:1988Natur.331..240S. doi:10.1038/331240a0. ^ "Comet 9P/Tempel 1". The Planetary Society. Retrieved 15 December 2008. ^ "Comet 81P/Wild 2". The Planetary Society. Archived from the original on 6 January 2009. Retrieved 20 November 2007. ^ Baldwin, Emily (6 October 2014). "Measuring Comet 67P/C-G". European Space Agency. Retrieved 16 November 2014. ^ Baldwin, Emily (21 August 2014). "Determining the mass of comet 67P/C-G". European Space Agency. Retrieved 21 August 2014. ^ Borenstein, Seth (10 December 2014). "The mystery of where Earth's water came from deepens". Excite News. Associated Press. Retrieved 14 December 2014. ^ Agle, D. C.; Bauer, Markus (10 December 2014). "Rosetta Instrument Reignites Debate on Earth's Oceans". NASA. Retrieved 10 December 2014. ^ a b Filacchione, Gianrico; Capaccioni, Fabrizio; Taylor, Matt; Bauer, Markus (13 January 2016). "Exposed ice on Rosetta's comet confirmed as water" (Press release). European Space Agency. Archived from the original on 18 January 2016. Retrieved 14 January 2016. ^ Filacchione, G.; de Sanctis, M. C.; Capaccioni, F.; Raponi, A.; Tosi, F.; et al. (13 January 2016). "Exposed water ice on the nucleus of comet 67P/Churyumov–Gerasimenko". Nature. 529: 368–372. Bibcode:2016Natur.529..368F. doi:10.1038/nature16190. ^ Baldwin, Emily (18 November 2014). "Philae settles in dust-covered ice". European Space Agency. Retrieved 18 December 2014. ^ Krishna Swamy, K. S. (May 1997). Physics of Comets. World Scientific Series in Astronomy and Astrophysics, Volume 2 (2nd ed.). World Scientific. p. 364. ISBN 981-02-2632-2. ^ Khan, Amina (31 July 2015). "After a bounce, Rosetta". Los Angeles Times. Retrieved 22 January 2016. ^ "Rosetta's frequently asked questions". European Space Agency. 2015. Retrieved 22 January 2016. ^ JPL Public Information Office. "Comet Shoemaker-Levy Background". JPL/NASA. Retrieved 25 October 2008. ^ Whitney Clavin (10 May 2006). "Spitzer Telescope Sees Trail of Comet Crumbs". Spitzer Space Telescope at Caltech. Retrieved 25 October 2008. ^ Donald K. Yeomans (1998). "Great Comets in History". Jet Propulsion Laboratory. Retrieved 15 March 2007. ^ H. Boehnhardt. "Split Comets" (PDF). Lunar and Planetary Institute (Max-Planck-Institut für Astronomie Heidelberg). Retrieved 25 October 2008. ^ J. Pittichova; K.J. Meech; G.B. Valsecch; E.M. Pittich (1–6 September 2003). "Are Comets 42P/Neujmin 3 and 53P/Van Biesbroeck Parts of one Comet?". Bulletin of the American Astronomical Society, 35 #4. Retrieved 1 March 2010. ^ a b "Comet May Be the Darkest Object Yet Seen". The New York Times. 14 December 2001. Retrieved 9 May 2011. ^ Whitman, Kathryn; Morbidelli, Alessandro; Jedicke, Robert (2006). "The Size-Frequency Distribution of Dormant Jupiter Family Comets". Icarus. 183: 101–114. arXiv:astro-ph/0603106. Bibcode:2006Icar..183..101W. doi:10.1016/j.icarus.2006.02.016. ^ a b c d e esa. "Giotto overview". European Space Agency. ^ Organic compounds (usually referred to as organics) does not imply life, it is just a class of chemicals: see Organic chemistry. ^ J. A. M. McDonnell; et al. (15 May 1986). "Dust density and mass distribution near comet Halley from Giotto observations". Nature. 321: 338–341. Bibcode:1986Natur.321..338M. doi:10.1038/321338a0.